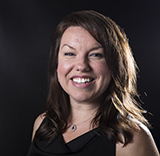 Pamela, a gifted soprano, is the head of voice performance and School of Music co-ordinator at Cambrian College. She attended the University of Ottawa and Laurentian University. She is also conductor of the Bel Canto Choir. A: The people. I have deep roots here. Most of my family and friends are here; they are my greatest supporters and sources of happiness. I’ve also been lucky enough to build a fulfilling career in Sudbury which allows me to find great joy in my professional life. I’m blessed to find myself supported, loved, challenged and inspired. A: Although my teaching career is still relatively young, I’m most proud when students find success. I feel proud when I see our work together have a positive impact on their lives and the lives of those around them. That’s the beautiful thing about teaching in the arts; the lessons learned can have a ripple effect, bringing enjoyment to not just one but many. A: I’ve learned life is precious and short, so live it to the fullest and surround yourself with good people. I’ve also learned (and am still learning) of the importance of drawing on the wisdom of mentors and elders; their wisdom and experiences are extremely valuable. A: Never be afraid to admit you’re wrong. By owning your mistakes/short comings, not only will you learn from them sooner and simply get better at what you do, but you will earn the trust of others. I truly believe trust is a cornerstone of respectful, productive relationships.